I fell in love with twice baked potatoes as a kid. I still remember my mom and dad making twice baked potatoes for the first time. They had the old BH&G cookbook (with the red and white checked cover) opened up on the counter. Dad reading the recipe to Mom, while they both worked on adding ingredients together. That creamy mashed filling, stuffed back into a baked potato jacket was such a treat. One- Who doesn’t love a baked potato combined with butter, cheese, and sour cream? The second reason to love this dish- it can be made ahead and stored in the fridge until you’re ready to bake and serve. 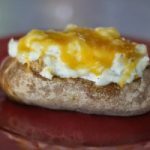 Because of the creamy filling, Loaded Twice Baked Potatoes taste just as good several days after they are made. The addition of the sour cream and half and half keeps the filling perfect for reheating. This dish is perfect for busy cooks who want to make ahead and enjoy the holiday. Want a little step by step? discard, then scoop out the insides. I was probably a little aggressive with the scooping. It’s best to leave a little more of the potato attached to the skin. Make the filling as directed in the recipe, then carefully fill the skins. Top with cheese just before the second bake. On this potato, I topped it with Smoked Gouda and Cheddar. What else are you serving for Christmas dinner? My friend Linda at The Organic Kitchen is dedicated to creating healthy and delicious recipes for home cooks. Her recipe for Pear and Brie Salad with Honey Champagne Vinaigrette is simple and fresh and a perfect healthy addition to your holiday meal. Check out The Organic Kitchen for instructions on how to arrange this festive salad. I love it paired with Ham with Grilled Pineapple and Pomegranate Pineapple Glaze, and Loaded Twice Baked Potatoes. Steam some fresh green beans, and you’ve got a beautiful colorful, easy to serve meal. Wash and pat potatoes dry. Pierce the potatoes with a fork about three times to allow heat to prevent bursting of skins. Preheat oven to 350°F. Bake potatoes on rack for about 1 hour 15 minutes, or until knife is easily inserted in center of potato. Remove from oven and place on cookie sheet or cutting board. Cut the top fourth of the potato off lengthwise and discard. Using a dishtowel to cover your hand, hold the potato and gently scoop the hot potato out of the skin and place in a large bowl. Place the potato skins back onto the cookie sheet. Continue until all of the potatoes are scooped into the bowl. Add the butter, warmed half and half, salt and pepper. Using a potato masher, smash the potatoes until the half and half and butter are incorporated. Add the sour cream and grated cheese, mash again. Taste to see if the mixture needs more salt and pepper. The potatoes should be very creamy and soft. If they are not, add additional half and half or sour cream until soft (a few tablespoons at a time). Using a large spoon, fill the potato skins. Heap the mixture up in the middle of the potato. Top with additional grated cheese (if eating right away, if saving for later, do not top with cheese at this time). If eating right away, bake in oven for about 15-20 minutes, uncovered. Serve immediately, or keep warm in oven until serving. Serving size is one potato per person. -This recipe varies depending on the size of the potato. If the potatoes are large, you may use more half and half and sour cream to achieve the desired consistency. You're looking for the same consistency you will find in a creamy mashed potato.-If making ahead, stuff the potatoes after making the mashed mixture. Cover with plastic wrap and place in refrigerator. When ready to cook, uncover and let sit on counter for about 30 minutes. Bake in center of oven for about 30 minutes at 350 degrees or until heated through. Remove from oven during last 10 minutes of cooking and top with grated cheese. place back in oven and let cheese melt.-If you are making this for young children or others with smaller appetites, you may use two small potatoes in place of one large.-I always use Russets. Their skins are tougher than any other potato and will hold up to being baked, scraped and then re baked. You may rub the skins with oil for a nicer appearance and better texture for eating after the second bake.-If you have any extra filling, place it in a bowl and reheat later. I have not eaten a baked potato in quite a long time~but I think the time will soon arrive! They do look delicious and not that difficult or time consuming. thanks for the recipe! Made these and they are so yummy!